Make yourself look presentable with the help of this QT4005/15 beard and stubble trimmer that is brought from the house of Philips. 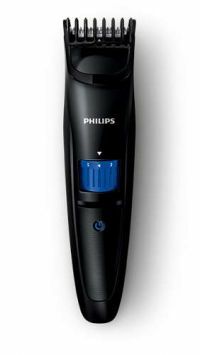 Philips QT4005/15 Trimmer Make yourself look presentable with the help of this QT4005/15 beard and stubble trimmer that is brought from the house of Philips. 20 locking length settings - Turn the wheel to simply select and lock-in the length settings you want: from a 3-day beard of 0.5mm up to a full beard of 10mm, in precise 0.5mm steps. Built to last - All of our grooming products are built to last. They come with a 2-year worldwide guarantee and worldwide voltage compatibility; they never need to be oiled. Charging indication = The light on the adaptor is green when charging. Perfect 3-day beard every day - Set the trimmer at the lowest position for a perfect stubble, just 0.5mm long. Rechargeable - Rechargeable only. 35 minutes of cordless power after 10 hours of charging. To Recieve updates and possible rewards for Philips QT4005/15 please sign in. To Recieve updates and possible rewards for Trimmer, Clipper & Shaver please sign in.